Sometimes you meet people that really make an impact on you. Michal did just that. I met her through Danya. Danya’s sister grew up with Michal’s sister and when Michal, a former professional basketball player decided she needed photographs for her new catering/baking/not defined company, she turned to Danya. I met Danya the day after she had photographed for Michal and Danya was smitten. She came back telling me all about Michal, how talented she was, how her banana bread was the best she had ever tasted, and just how overall how cool she was. About a month later Danya and I were asked to photograph an article for a local food magazine and they were looking for someone to write the recipes and prepare the food. Danya suggested Michal, and that was how I met her for the first time. From the second I saw/tasted her food I was inspired. I was inspired so much that that article was one of my most favorite I’ve ever styled. Michal had mentioned that day that she was thinking about participating in the upcoming season of Master Chef. We worked together that one day and then the next time I saw her was on TV being accepted to the new season of Master Chef. I was so proud and happy to see her fulfilling that dream. 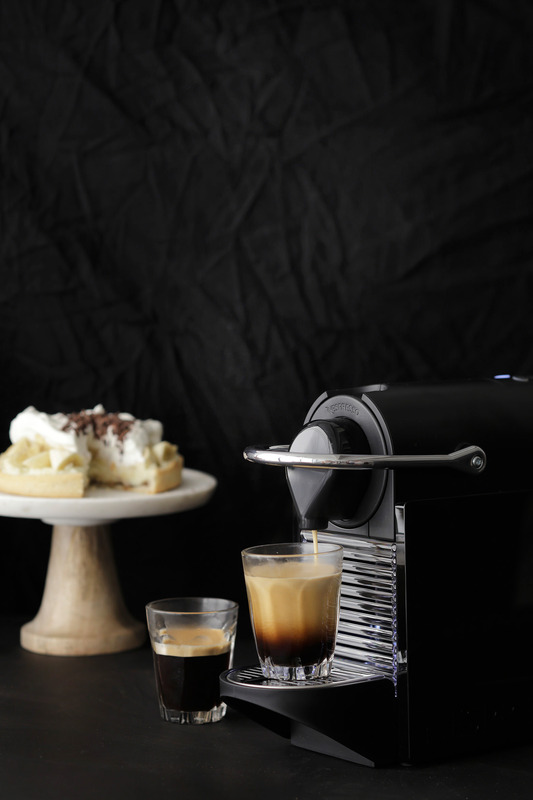 Just as the show was over, Danya and I were contacted by Nespresso to style a blog-post using their new Pixie-Clips machine. 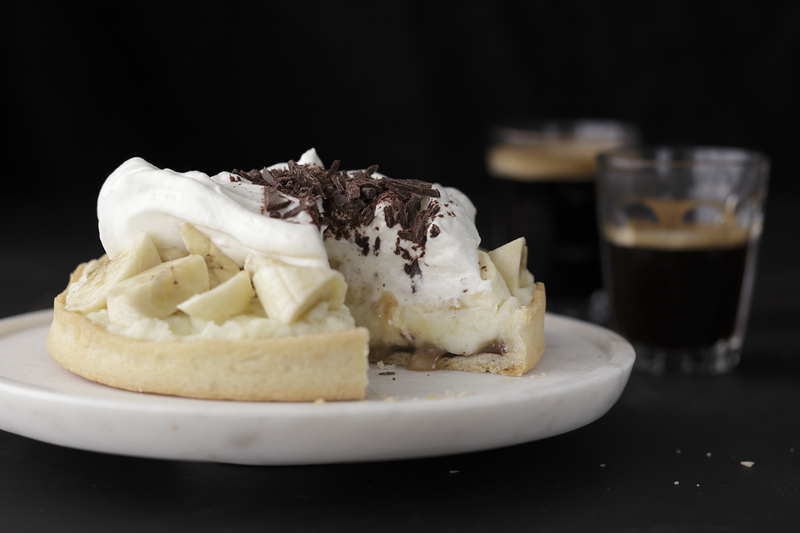 Not sure why, but I immediately thought of Michal, and the banana-cream pie she tried to make on her final episode, but due to time restraints didn’t finish. And there she was, back in Danya’s studio, making the most heavenly pie I have literally ever tasted. This one is so worth the effort. Using a food processor, blend the flour salt and butter, pulsing until it reaches a sand-like texture. Gradually add the water while pulsing, until dough is formed. Remove from refrigerator about 20 minutes before making the pie. Working on a lightly floured surface, roll out the dough to a 10-inch circle about 1/8-inch thick. Place dough into a pie dish and cover with aluminum foil. Place baking weights on the foil (dried beans or rice will do). Bake for 20 minutes, until golden. Remove from oven and place on a cooling rack. (The crust can be frozen after baking). In a medium saucepan, heat the milk, vanilla and salt until just boiling. In a bowl, whisk together the sugar, cornstarch and eggs. Once the milk has just about boiled, place a small amount of the hot milk into the eggs and whisk. Pour the egg mixture, gradually into the hot milk while constantly whisking. Whisk constantly while on medium heat for 5-7 minutes, until the mixture thickens. Place the pastry cream in a clean bowl and cover with plastic wrap (so that the plastic is actually touching the top of the cream). Refrigerate for up to three days. In a small saucepan, heat the heavy cream and vanilla until just boiling. Reduce heat and keep on a low flame. In the meantime, in a medium pan heat the sugar, water and salt on medium heat until the sugar melts and starts to boil. Allow mixture to boil for about 7-8 minutes, until the sugar changes colors and turns a deep orange color (being very careful not to burn it). Remove from heat and pour the heavy cream mixture into the sugar mixture. Mix gently with a whisk until the mixtures combine and caramel is formed. Place caramel in a clean jar and store in the fridge for up to a month. In a bain-marie, heat the chocolate until melted and keep aside until ready to use. 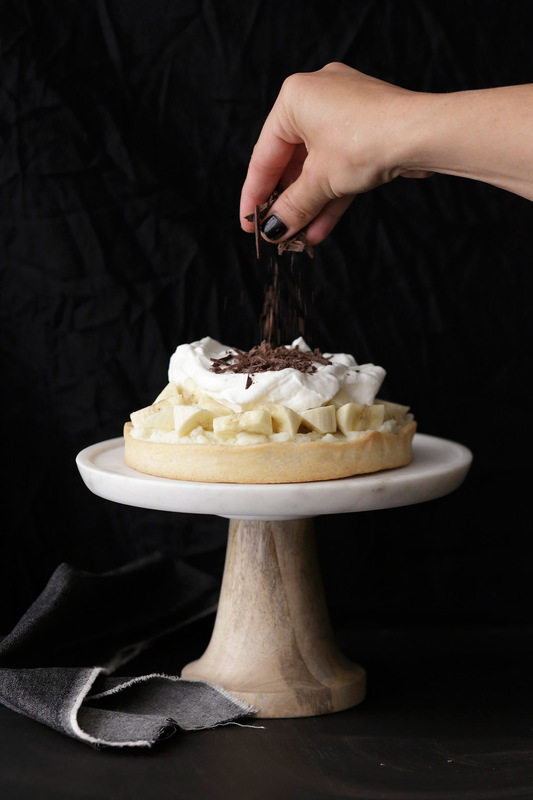 Once the pie crust has completely cooled, spread an even layer of chocolate onto the crust and refrigerate for 15 minutes. Once the chocolate hardens, spread an even layer of the caramel and refrigerate for 15 minutes. Fill the pie with the pastry cream and refrigerate for an hour. 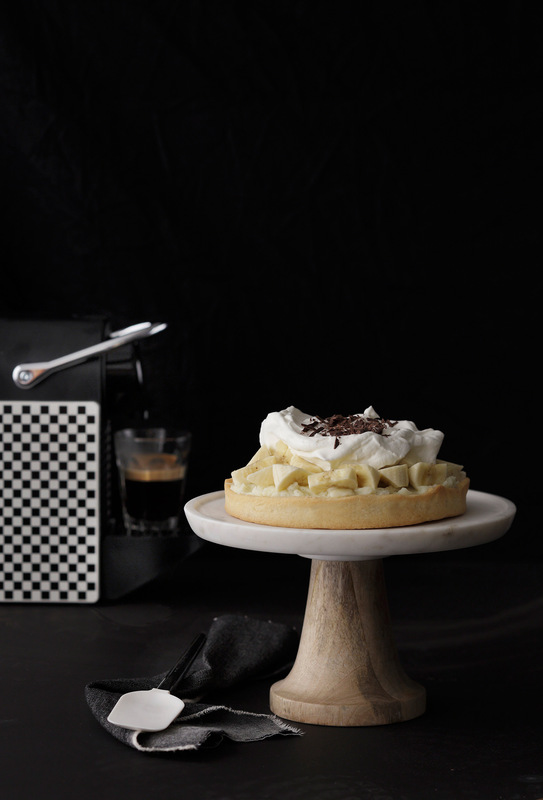 Top with a large dollop of whipping cream and top with banana slices and chopped chocolate. Keep refrigerated until serving.